Thanks everyone for asking such lovely questions! I study media production. Basically I'm educated in all the different types of media and how to stategically use them to reach your desired clientele. This could make me end up anywhere from working at a magazine or a website to TV and radio. I'm floating a bit more towards the direction of magazines and internet, so I can combine all my skills; writing, photography and my media-degree. I recently finished an internship at a big Dutch musicmagazine. Is your photography part of your career, or do you have another job? Not right now, really. I should try and look for photojobs but I've been busy with lots of things like school and internships and traveling. I don't have a job right now but I've worked at restaurants for the past 6 years or so. Right now I'm living off my student grant & loan for a bit. What did you think your life would be like 10 years ago? Good question! I was 11 then. I guess I always had in mind that I wanted to do something with writing, and I've always had a really strong connection with images. So I guess it makes sense that I'm doing what I do. I certainly hadn't pictured myself spending so much time in Sweden with such a lovely man! I think right then I was still convinced I was going to marry Thom Yorke. I have a few favorites; I really love pizza, I could eat it every day but unfortunately a person needs more nutrients than that. Another big big junkfood favorite is fries with lots of mayonaise. And I love falafel. And edamame beans. And burritos. And hamburgers. Oh so much good food! My least favorite is fish. I really don't like fish or any seafood. I also can't stand cheese when it's not melted. No, Daniel is a vegetarian and he even used to be vegan. That's why we eat a lot of vegetarian and vegan meals at home. When we eat out I do often eat meat, though. But I don't miss it at home. For example; this is a completely vegan meal we eat a lot and it's soooo good. 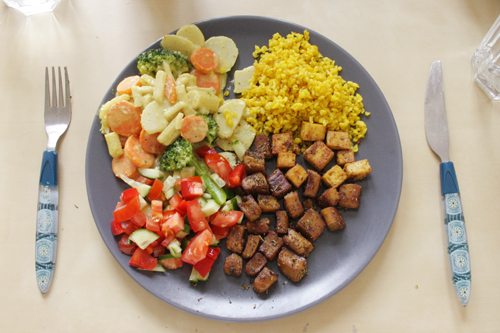 tofu and Veggo-chickenreplacement with bulgur, salad and vegetables stirfried in curry and coconutmilk. Superyummy and superhealthy! Are the pics from Daniels phone naturally like that or do you edit them? if so what program do you use? We use an iPhone app called Hipstamatic. I feel sort of lame 'faking' Holga photos but I really like the way these come out. At least a lot nicer than the 'regular' phonecamera. How did you and your boyfriend meet? We met in October 2008 on a ship called MS Stubnitz in the harbour of Amsterdam. His band was playing there and my friend conviced me to go see them. You can read the whole story in this blogpost. Are you planning on moving to Sweden? There is a possibility. Being in a long distance relationship is extremely difficult and I'm really proud of the fact that Daniel and I manage so well. Of course it can be devastating at times but I think that only proves how much we care about each other and how hard it is to be away from each other. For now the only problem is that I want to finish my studies (which is 2 more years) and get a diploma. I really hope we find a solution (meaning, an apartment in Amsterdam) before that time. If not, I guess I will move here after I'm done. I feel really comfortable in Sweden, it's such an amazing country with beautiful nature, interesting culture and wonderful people and I absolutely love every minute I'm spending here. What is the favorite piece of clothing that you own? Also, I think this is one of the prettiest dresses I own but I don't wear it in everyday life that often. How come you can always be wearing dresses? I mean; I wish I could, but I always have hair growing and showing! Haha! It's easy to always wear dresses cause I don't own pants! Of course I don't feel like shaving my legs every other day but that can be covered with tights. Do you feel totally comfortable in your body? And if you could, would you change (for example by plastic surgery) anything you don't like? I would say I feel comfortable in my body. Of course every person has things they're not 100% happy with, especially girls. When I was young, other kids used to tease me about my big nose. But instead of trying to change it, I embrace it and know that it's one of the things that gives me character and makes me different. I wouldn't be me without it. I'm so upset with this culture of plastic surgery and unrealistic beautystandards. I'm really disappointed in young girls like Heidi Montag or Ashley Simpson, who after plastic surgery lost all their charm and just became super generic-looking. What are your best beautytips? And your favorite products? I was actually thinking of doing a post on my beautyproducts etc soon, cause I do get quite a lot of questions about that and want to give it more attention. So that'll be coming up soon. Yes, I have to. A few years ago I dyed my hair white-blond, and my hair is still really damaged from that; I would strongly recommend staying away from bleach. When I went back to brown -my natural haircolour- about 4 years ago, the colour didn't hold that well on the parts that have been bleached. It still hasn't grown out fully, and I know I should just chop it off, but I really want to keep my length. Me in 2005 with blond hair. I really like the old Disney movies. And I have such a giant giant love for Jim Henson Company films, not particularly the Muppets, but movies like The Dark Crystal or The Labyrinth, and the TV series Dinosaurs. I really wish I could become a puppetmaker ever since I've seen the making of The Dark Crystal. It makes me extremely sad that puppetry is such a dying art, I have such a strong dislike towards the fact that everything is done with CGI these days. It lacks so much personality and magic. I use a Canon EOS 1000D. I must admit it'd love to have a better one but I really wanted a DSLR and this is the only one I could afford at the time. Anyway, I hardly ever use the kit-objective cause it's really bad; I bought a 50mm 1.8 instead so now the quality of my pictures is, say, sufficient until I win the lottery or get a job again. Besides the digital I use a Minolta X-700 (analog SLR). I also created a formspring account, so for any further questions you can always go there, or just send me an e-mail, of course. 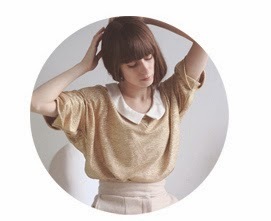 you have the most wonderful blog. I miss you on flickr though! Oh and I love The Labyrinth- it's amazing.